Brush Ninja is a free, online, animated gif creator. You can draw, animate, and download your own creations right from within your web browser using any electronic device. I first released Brush Ninja in 2018, and have published dozens of updates and improvements since; many of which were suggested, or based upon, community feedback; and I hope to do this for a long time to come. Brush Ninja has found a wonderful audience within the education sector. I find it amazing that my app is being used to educate the next generation. Brush Ninja online is totally free. 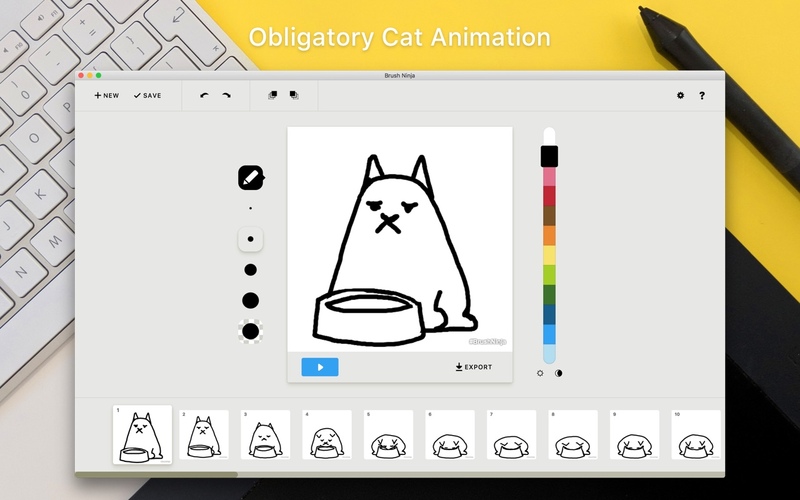 There is also a desktop version that allows you to create animations on your Mac without an internet connection. However my focus is on the core experience in the web browser. Over the last year I have worked on Brush Ninja as time allows, but I would love to be able to spend more time improving the application. Make it as easy to use as possible. With your help I would like to continue creating the best online animation tool I can. Any amount you can offer will get me closer to giving this project the time it needs to really shine. Eventually I would really like to make Brush Ninja totally free, and have the online, and desktop versions of the app function in exactly the same way. You make Brush Ninja possible! I will add the ability to use your own custom background images to all versions of the app.